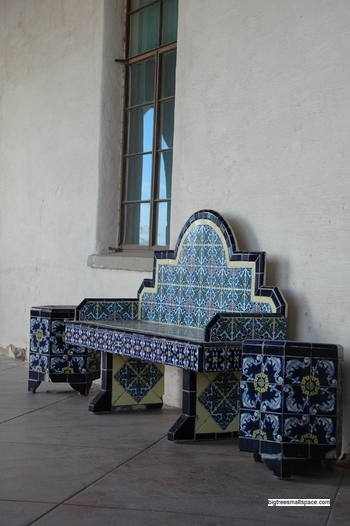 Ironic — the bench is elegant and ornate, but also somehow unapproachable, like many aspects of art, and religion to the extent that it is also an art form. The wall behind the bench seems inviting and touchable, but not the bench itself. If I were to enter this scene, I would sit on the ground next to the bench and lean against the wall. I love the colors in this photo, the limited palate of greys, blues, and yellows, and the blue reflection in the window above the bench.